Pre-inked, re-inking fluid compatible with Clik™ and Universal™ stamps. Made in the U.S.A. and TAA compliant. 7 ml. plastic bottle. 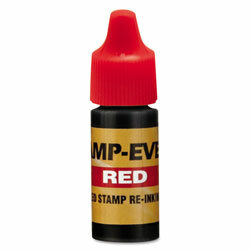 Capacity (Volume) : 20.000 mL; Ink Color(s): Red; Refill(s) For: N\A; Ink Types: N\A. WARNING: This product can expose you to Diethanolamine, which is known to the State of California to cause Cancer. For more information go to www.P65Warnings.ca.gov. 20.000 mL Stamp Pads and Ink Refills from U.S. Stamp & Sign! 1082 In Stock today.